Endless truly procedural roads across different biomes and beautiful scenarios to experience the joy of driving. 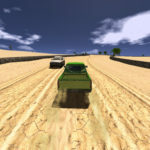 With builtin web radio streaming, realistic physics and a night and day cycle it’s up to you how to experience the game, pick a slow and resistant car to have a long, safe and relaxing drive on the freeway across the desert, or grab a supercar, take the first exit and end up on a windy and tight mountain road. Respect speed limits or escape the police, drive on paved roads or on sand ones, and all while listening to your favourite music. You’ll increase your score for each meter driven, but speed, road difficulty and time of day can greatly alter how much score you’ll make and different scoreboards for each car can turn each session into a new challenge that can adapt to many different drive/play styles. Keep in check your fuel and vehicle damage, and stop at service stations to refuel and repair your car, but beware, if you crash, finish your fuel or get arrested, you’ll start back from the first mile and al your score will be lost. The game is truly better than most apps I’ve installed on the App Store. The radio rations grabbed my attention the most since there are stations from all over the world! Gotta say this is a fun game to kill time late at night or on break at work; or when ever you need to hear Russian radio! A couple small bugs here and there but nothing really too game breaking, all in al a great game and something I enjoy playing. Great thanks for the kind words Jared. Very happy you are enjoying the game.